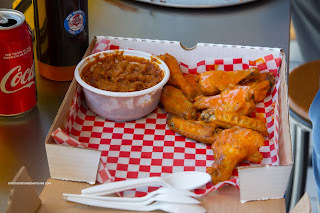 There once was a place on Dundas that served up pulled pork, wings and ribs to go with their fabulous pizza. 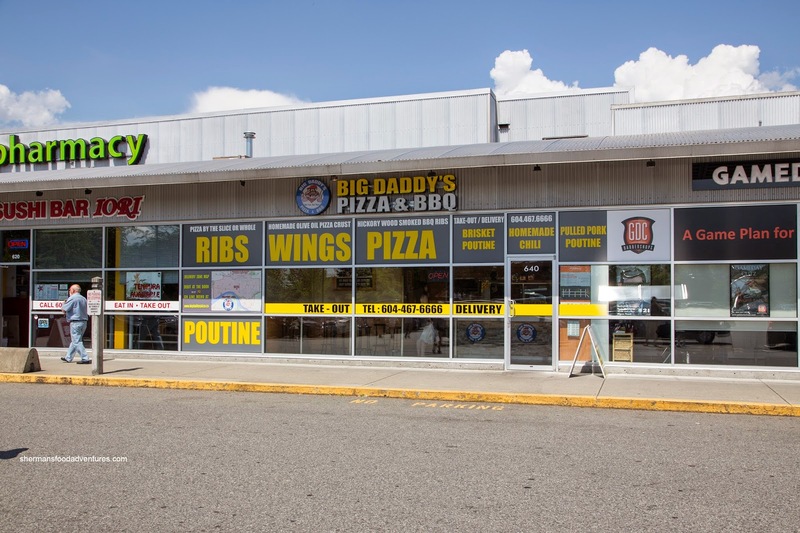 Located right next to the McD's, Big Daddy's was a hidden gem of sorts and definitely under-appreciated. Then one day, it was gone, just like the Pepper Roast right beside it. 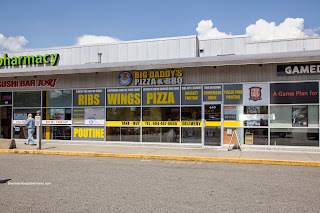 However, Big Daddy's didn't go way of the dodo, rather, it merely relocated to Maple Ridge in the Valley Fair Mall. Now, would I make a special trip out to try it out? Sorta, we were in the neighbourhood already at the Meadows batting cage. 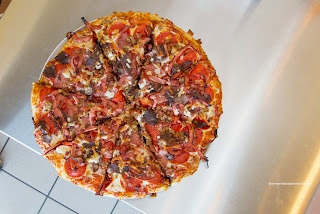 Being mainly a pizza joint first and foremost, we tried the Caveman Buffet with BBQ sirloin steak, pepperoni, salami, smoked farmers sausage, smoked ham and smoked ground beef. This monstrosity had toppings all the way to the edge of the crust (of which was crispy on the bottom and soft throughout). Marginally greasy (from the cheese) and appealingly smoky throughout, the pizza screamed out flavour without relying on the salt content. 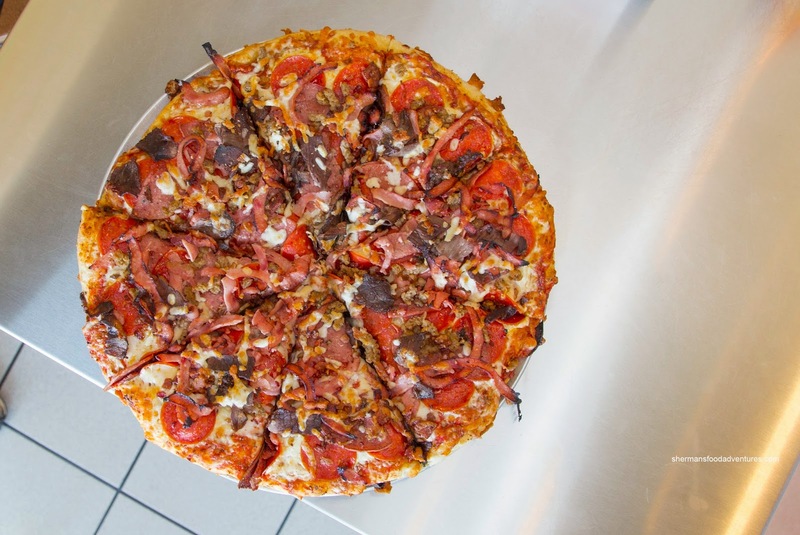 This was all thanks to the meats being smoked in-house (except for the pepperoni). Next up, we had the Smoked Wings with Cajun Sunshine sauce. These wings were pretty large while sporting a mild smoke. Naturally, the meat was on the drier side, but the ample amount of tangy and spicy sauce kept things moist. We found the side of baked beans to be texturally more akin to refried beans while being pretty sweet and loaded with bacon. 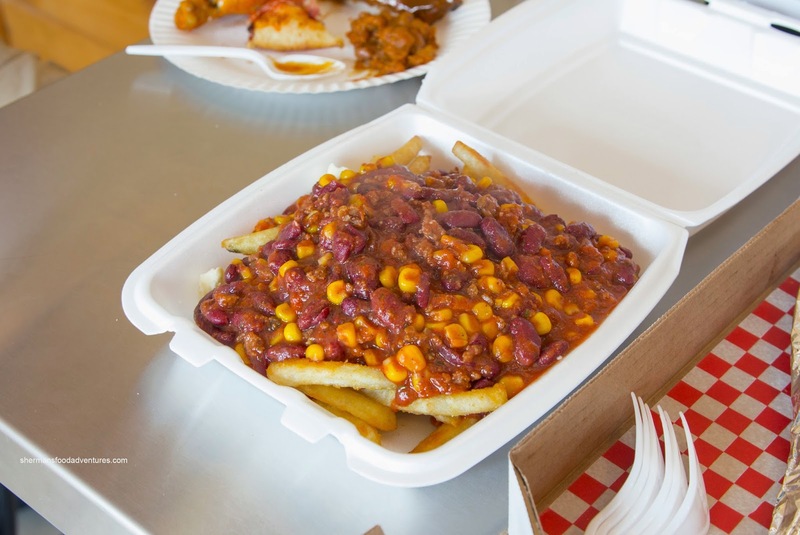 We then moved onto their poutines starting with the Chili Cheese Fries with smokehouse beef chili, cheese curds and fries. We would've preferred fresh cut fries rather than the frozen variety, but these were still very crispy and did the trick. There was a generous amount of meaty and spicy chili as well as ample kidney beans and plump corn niblets. Underneath, all the cheese curds were completely melted. We also tried their Pulled Pork Poutine with 18-hour smoked pork, gravy, cheese curds and fries. We enjoyed the tender and smoky pulled pork, but we could've done with a bit less gravy as it took away from the wonderful meat. 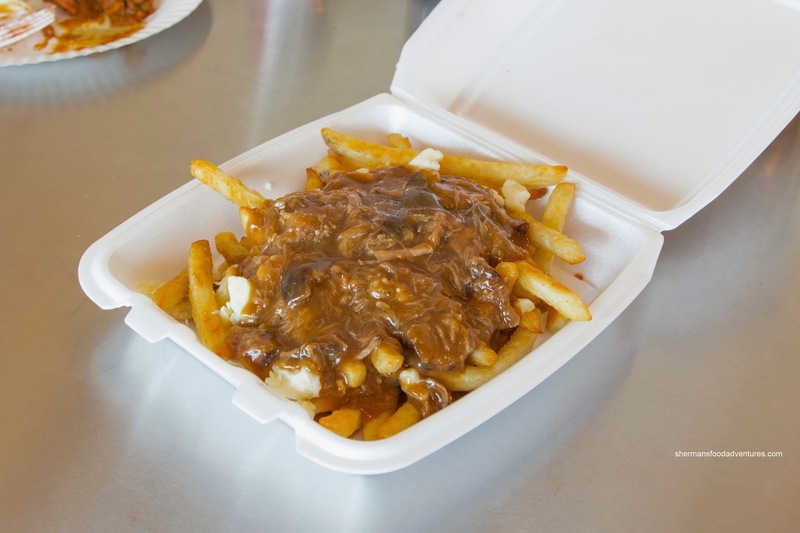 For me at least, I would've been happy with just pulled pork, cheese curds and fries without any gravy. To round out our selection of eats, we got a Full Rack of Hickory Smoked Ribs with Kansas City BBQ sauce. For those unfamiliar real BBQ and smoked meat, there is no parboiling allowed. Hence, the ribs here sported a deep smoke with tender, yet more drier meat. Naturally, the meat was sauced after-the-fact. I enjoyed the natural flavour of the meat in addition to the tangy and spicy BBQ sauce. 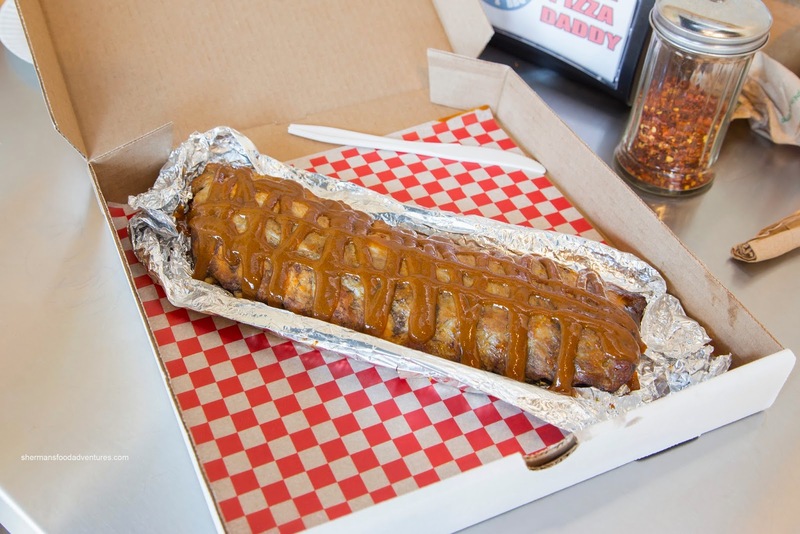 Being a pizza joint, this would be not possible, but these ribs would've been amped even further by a quick kiss on a BBQ. Not surprisingly, the highlight was the pizza (because it is mainly a pizza joint first). We had to fight for the last slice! Interestingly, we were looking for something a bit different and original in Maple Ridge... I guess we found it. I remember when they were on Dundas street and I ate there about 3 times. Fairly generous portions and good pricing. Then they left. And about 3-4 other restaurant take out places came and went too, including some imaginary Donair shop that o don't think ever even opened up. Glad to read the pizza place went out to Port Moody as the city there is growing with lots of condos and hopefully they are profitable out that way. @Tony Pizza is definitely good. They are in Maple Ridge though, not PoMo. Vancouver, B.C........they make fantastic real italian thin pizzas....super nice people too. Hi Sherman, it's Mike from Big Daddy's. I just want to thank you for your great review and constructive criticism (i.e. the Baked Beans). You were correct, we overcooked them in the smoker and they were extremely mushy. Got the smoker time just right now and also tweaked the recipe some and they are the best you can get in Canada. Also added to the menu, Cuban Black Beans with Pulled Chicken, Smoked Scalloped Potatoes with Bacon & Cheddar along with Bacon & Gravy Stuffing (all made in the smoker) plus Buttermilk Biscuits. Next time your in town, stop by and have a couple of racks of ribs with the new and improved sides (diner is on me this time).